Our work emphasizes the dynamic nature of plasmodesmata membrane domains, which can within few minutes of stimulation recruit PM located receptor-like proteins that presumably trigger local mechanisms that regulate plasmodesmata aperture and, thereby, the developmental response to environmental stresses. 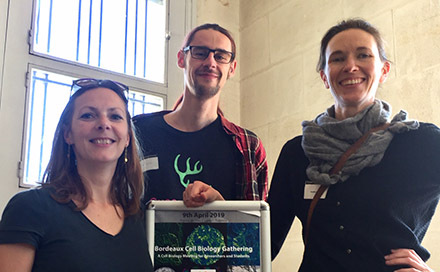 [2019, April 9th] Magali Grison, Jules Petit and Amélie Bernard participated to the 3rd Bordeaux Cell Biology gathering and gave a seminar. 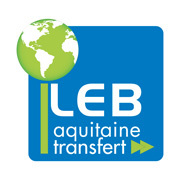 An interesting day with the Bordeaux scientist community. [2019, April 5th] Lilly Maneta-Peyret and Patrick Moreau collaborated to a project drived by Yvon Jaillais at the ENS Lyon on the role of the phospholipid phosphatidylserine (PS) in the control of Rho GTPase signaling in Arabidopsis. Live superresolution single-molecule imaging has revealed that the GTPase ROP6 is stabilized by PS into plasma membrane nanodomains which are required for auxin signaling. The PS content of plasma membrane varies during plant root development and its level modulates the quantity of ROP6 nanoclusters induced by auxin and hence downstream signaling. This work shows that variations in PS levels are a physiological process that may be leveraged to regulate small GTPase signaling during plant development. [2019, March 19th] Domingo Docampo (Université de Vigo, Spain) and Jean-Jacques Bessoule developed a straightforward bibliometric measure called Global Research Output (GRO)-index. This index, associated with quantity and impact of the scientific production, was used to analyse the scientific contribution of 189 countries and more than 4500 institutions all over the world. Countries and institutions were ranked based on the GRO-index, France was ranked 5, and among the institutions, CNRS was ranked 2. The index can also be computed for papers within a specific research field, and with relative indexes, normalized to world absolute measures. Given the simplicity of the methodology and the fact that its results can be easily understood by non-specialists, these indexes could become useful tools for the assessment of the research output of countries and institutions.